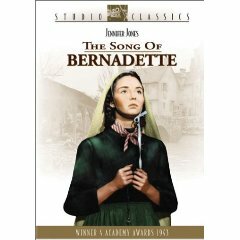 The Song of Bernadette is a dramatisation of Franz Werfel’s Popular book about Bernadette Soubirous, who had visions of the Blessed Virgin Mary in Lourdes. Bernadette was a pious, honest and simple child. She was quite slow in learning and even by the age of 14 she had not learnt her Catechism (knowledge of Catholicism) Despite ill health she worked hard in helping out her impoverished parents. One day while collecting firewood Bernadette had a vision of a “most beautiful lady” in the grotto of Massabielle just outside of Lourdes. Her first vision lasted for nearly 15 mins and she describes the lady as being small but beautiful beyond belief. Initially, she told her sister but asked her to keep it a secret. However, her sister couldn’t resist telling her parents, who initially very sceptical about Bernadette’s claims and wanted her to stop going to the grotto. The interest of the film is in how Bernadette, the church and the town officials react to these most arresting claims. Bernadette saw the Virgin Mary 18 times, although the film concentrates on only a couple of apparitions. Much of the dramatic tension is generated through her aggressive questioning by the Imperial prosecutor and chief of police. Bernadette disarms her critics with the most simple yet sharp responses. Never are they able to catch her off her guard. She maintains an impressive dignity, charm and purity that appear even more illumining given the scepticism and open hostility to her claims. 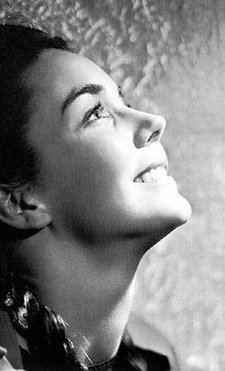 Much of the film’s appeal lies in the marvellous performance of Jennifer Jones. She is both beautiful and also manages to encapsulate the innocence and purity of a real Saint that Bernadette was. It is no easy task to play a saint. 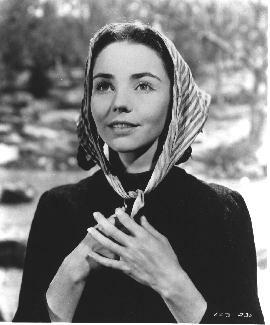 It is said Jennifer Jones prepared for her role by studying very carefully the life of Bernadette. Jennifer Jones was definitely deserving of her 1943 Oscar for best actress in a leading role. A film about apparitions and religious faith is perhaps difficult to do without slipping into sentimentality. But more or less the film manages this it is genuinely moving but in a spiritual rather than sentimental sense. Sceptics may feel the film is weighted towards a certain angle, but the film deserves credit for an intriguing portrayal of how Bernadette’s visions affected, her family, church and the local community. The film is not without humour, nor is it ringing endorsement of Catholicism. Much of the initial opposition came from staunch Catholics. The lady’s first words to Bernadette were quite prominent throughout the film. More than anything the film leaves you with a deep deep reverence for Bernadette Soubirous who succeeds in proving the validity of her claims through her saint-like life. The film does take certain liberties for dramatic effect. For example, in the film, her young male friend Antoine Nicolau, appears to be deeply in love with her. In one scene he promises to remain unwed when she moves to the convent. However, this emotional relationship between the two was exaggerated by the author Franz Werfel. Other characters like the imperial prosecutor had their anti-religious feelings exaggerated, but more or less the film does portray the fundamental story of how one girl dealt with visions of the Virgin Mary. The film is directed by Henry King and is also an accurate reflection of the conditions of Lourdes in the mid-nineteenth century. Citation: Pettinger, Tejvan. “Film Review- ‘Song of Bernadette’”, Oxford, UK. www.biographyonline.net, Published 1st Feb 2009. Last updated 30th January 2017.